A lot of palaeoclimate research makes use of stable oxygen isotope compositions of various substances, like ice cores or microfossils. But what are isotopes and how do they end up in our climate records? The Oxygen-18 isotope has an extra two neutrons, for a total of 10 neutrons and 8 protons, compared to the 8 neutrons and 8 protons in a normal oxygen atom. Picture from NASA. Water (H2O) of course contains a lot of oxygen atoms. 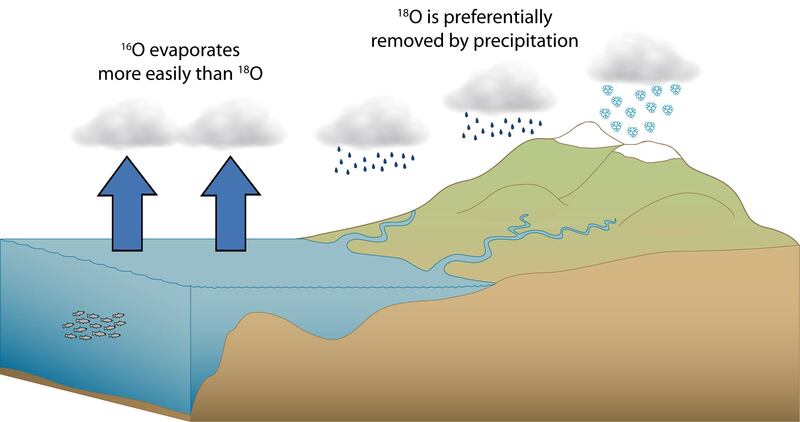 When clouds form over the ocean, fewer of the heavy isotopes will evaporate, resulting in clouds that are depleted in 18O. When these clouds than move over land and start to produce rain, the molecules containing the heavy isotope will rain out first. This results in rain containing less and less 18O, the further you go land inwards. This so called fractionation between light and heavy isotopes is most pronounced at low temperatures, since at high temperatures enough energy is available to mobilise both isotopes. So temperatures can also be reflected in oxygen isotope compositions. This is for example the case in in oxygen isotope records of microfossils from the ocean floor (benthis foraminifera). In the well-know ice cores both processes are at work, and result in an accurate reflection of ice ages and interglacials over the past several millions of years. 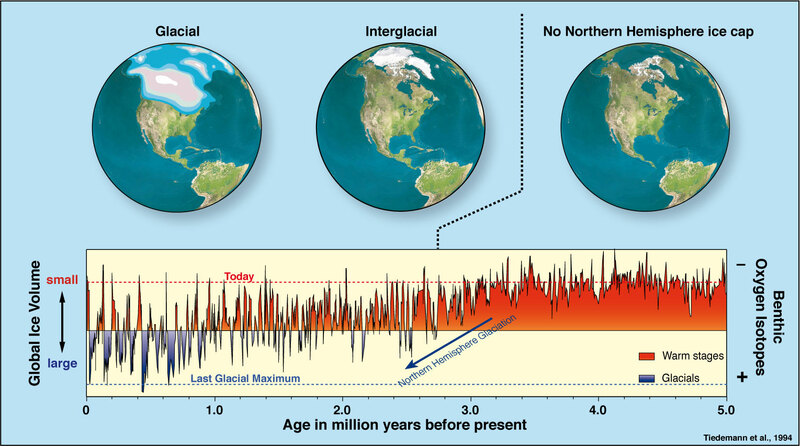 Categories: Climate, Oxygen isotopes | Tags: ice age, ice core, microfossils, stable isotopes | Permalink.